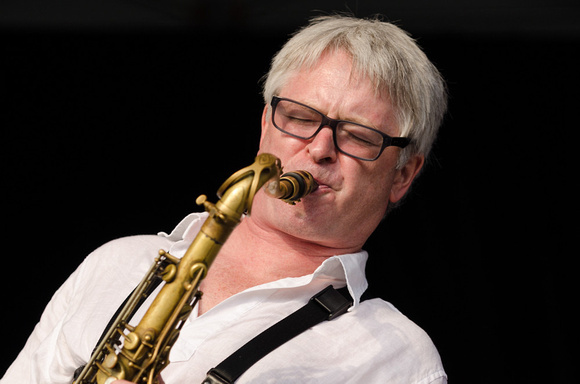 An engaging, lyrical saxophonist, Mike Murley is one of Canada’s most celebrated and well-respected jazz artists. Currently active as a leader in various formations from duo to septet, Murley also maintains a busy schedule as both a sideman and an Associate Professor at the University of Toronto Jazz Program. He has played on fourteen Juno Award-winning recordings since 1990, seven as a leader or co-leader, seven as a sideman. His most recent Junos include The North (2018), Metalwood’s Twenty (2017) and his trio’s Test of Time (2013).Since moving to Toronto from his native Nova Scotia in 1981 Murley has enjoyed a career that has spanned a wide stylistic spectrum. Recordings with legendary Canadian artists such as Ed Bickert, Guido Basso, and Rob McConnell showcase the saxophonist’s talents in the mainstream standard repertoire. On the more contemporary side, Murley has collaborated frequently with the younger generation of improviser/composers including pianist David Braid and guitarist David Occhipinti. He is also well known for his work with the three-time Juno Award winning electric jazz group Metalwood. In addition he has recorded and performed with numerous other Canadian and international artists including John Abercrombie, David Liebman, Paul Bley, John Schofield and Kenny Wheeler. Hailed in the Canadian press as “one of his country’s true renaissance men when it comes to music” (The Ottawa Citizen), and “a jazz genius to call our own” (Maclean’s Magazine), composer and pianist, David Braid is an eight-time Juno nominee, and winner of three Juno Awards for his solo piano recording, ’Verge’, large ensemble recording, ’The David Braid Sextet Live.’, and small ensemble, “The North”.Braid concertizes his original music and improvisations in the UK, Scandinavia, Continental Europe, Russia, China, Australia, The United States, and Canada. Combining the discipline of European classical music with the spontaneity of jazz, Braid’s music is described as “brilliant” (Montreal Gazette), “wide-ranging, exploratory” (South China Morning Post), “une force poétique” (Le Soleil) and “hauntingly beautiful” (The Globe & Mail).